How to avail Agri, Fisheries, Forestry, and VetMed Scholarship from ACEF - Exam News, Reviewer, Military Career, & Everything [MN] . .
Department of Agriculture secretary Manny Pinol encourages students who are interested in pursuing a degree in agriculture to avail a scholarship through Agricultural Competitiveness Enhancement Fund (ACEF) scholarship program, this scholarship is intended for children of Filipino farmers and fisher folks. In Facebook post, Sec. 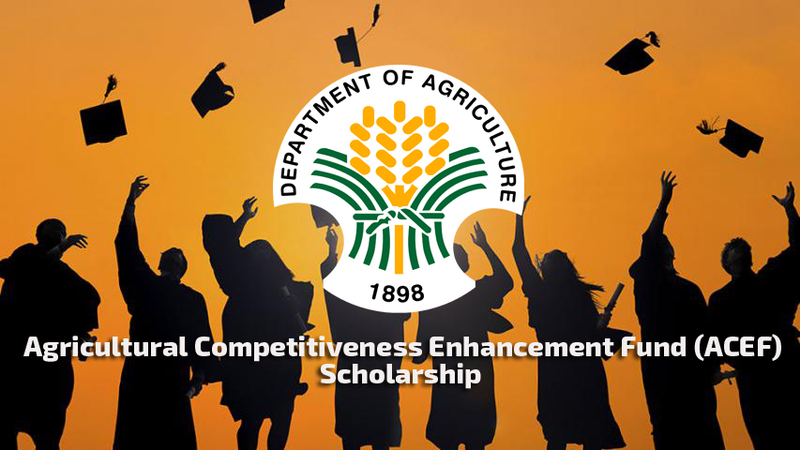 Pinol said that the scholarship which could be availed of in government colleges and universities all over the country is funded by the ACEF or Agricultural Competitiveness Enhancement Fund. He also added that the ACEF comes from the collections of duties and levies on all imported agriculture items and was originally intended to be loaned out to farmers and fisherfolk who are affected by the importation of the same product. On the same note, in an interview on the Maunlad na Magsasaka radio program (702 kHz DZAS), DA Undersecretary for Special Concerns Atty. Ranabai Dilanglen discussed the details of the scholarship programconsistent with the provisions of RA No. 9464 or the Agriculture Competitiveness Enhancement Fund (ACEF). Since the early 90s, the ACEF scholarship program of the DA has continuously provided assistance to students taking up agriculture and fisheries. According to Usec. Dilangalen, pursuant to RA 10848, which was signed into law on February 16, 2016, the implementation of the ACEF scholarship, will be transferred to the Commission on Higher Education (CHED) after the law’s implementing rules and regulations have been approved. To join the scholarship, you may reach out to the scholarship coordinators in partner institutions and submit the following initial requirements, Form 137, Certificate of Good Moral Character, and Barangay Clearance as proof of indigency, and proof that the applicant is a child of a farmer or fisher folk. Grantees will enjoy benefits including free tuition fee and miscellaneous fee (excluding books), monthly allowance worth P 1000, and a thesis writing allowance of P 5,000.00. The scholarship will cover the entire duration of the academic program. In exchange, a scholar must pass all enrolled subjects every semester and maintain a general average (GWA) of at least 3.0. Another benefit of being a grantee is that when it comes to employment, after successfully graduating from the chosen course, a scholar is given a priority in the Department of Agriculture and its attached agencies and bureaus. Or they will be assisted in finding a job related to their field of expertise in case there is no vacancy in the Department. Although there are issues of corruption concerning ACEF, Secretary Manny Pinol is positive that the scholarship will be a success, as long as information will be well disseminated. “So if you have children who are bright and interested to go to college as ACEF scholar, please visit the nearest government college or university near you” said Pinol.